In 1996, Dr. Peter Gutmann of the University of Auckland presented a paper about recovering data from hard drives using “magnetic force microscopy.” This was possible due to a magnetic shadowing effect which permitted data to be reconstructed when it was thought to be destroyed. In response to this security threat, he recommended a specifically defined 35 pass wipe process so that data on wiped drives could not be uncovered. The report was widely cited and spawned a whole host of wiping standards (including what is referred to as the DoD 3-pass wipe) to try to better manage this data security risk. Many enterprises continue to base their data sanitization program on what is known as the "Department of Defense (DoD) 5220-22.M Standard”. This is not actually a standard, but is a reference to the National Industrial Security Program Operating Manual (NISPOM) which was originally published in January, 1995 and reissued in February, 2006. (The original document is no longer published on government web pages, but is archived at: http://www.fas.org/sgp/library/nispom/nispom2006.pdf). When did the wipe recommendation change? The US government commissioned the National Institute of Standards and Technology (NIST) to devise a more comprehensive approach to data security. As a result, they published the “NIST Special Publication 800-88: Guidelines for Media Sanitization” in 2006. (http://csrc.nist.gov/publications/nistpubs/800-88/NISTSP800-88_with-errata.pdf). The 2012 NIST Guideline provides an exhaustive overview of all the various storage media deployed today and offers recommendations for clearing, purging and/or destroying data on each one of them. Firms should match NIST’s recommendations to their internal security processes to make sure all assets they own are effectively secured during disposition. January 28th is Data Privacy Day. It's a good time to take a look at how you protect privacy for yourself and your organization's IT infrastructure. Be sure to not forget data security during disposal. Look to http://dataprivacyday2010.org/ for event details. The Gartner IT Financial, Procurement and Asset Management Summit held in Orlando over the past few days focused primarily on how enterprises can effectively operate their ITAM programs in a challenging economy. Conversation was centered around cost cutting, managing vendor relationships, and maintaining quality IT systems with less people. It was a far cry from last year's conference directing IT asset managers to develop new and innovative programs that drive business value creation. There was a reactionary, conservative feel to the conference. With expectations of continued shrinking budgets and a lingering recession, companies are concerned about investing more into IT. Sure, there was some talk about new trends in technology for advancing business goals, but there was much more discussion this year about risk management. Even the keynote speaker, P.J. O'Rourke, was a conservative. It's unfortunate there wasn't more discussion about how to make Information technology and IT assets enablers for emerging from this economic rut. Technology is at the center of discussions about health care reform. How can we use the vast amount of technological assets to deliver quality and affordable care no matter what form it takes? Jack Heine did raise the topic of "smart buildings" as a way to create more efficient and comfortable facilities, but where was the challenge to create a smart grid and smart communities with technology and services supplied by companies in attendance? IT Asset Management is the discipline of managing all this technology, so that it is in the right place at the right time performing optimally and in compliance with licensing and usage requirements. As technology becomes more ubiquitous, IT asset managers will be more challenged in dealing with all these issues. The complexity of deploying, maintaining and managing these varied assets is further pronounced during the disposition process (of which I am much more involved). How are we to deal effectively with the security, environmental compliance, license repurposing, and cost considerations of asset disposals when we deal with more than just simple desktop computers and monitors? Businesses should take this opportunity to apply the power of technology to enable business value generation for both their internal and external customers. That's how we'll gain efficiencies and thereby reduce costs. Conservative cost cutting alone will make us less competitive in the long run. We'll pay a much greater price in the end. What's the standard for best practices? In IT Asset Retirement, there's a brewing battle over what should be the pre-eminent standard for computer refurbishers and recyclers. It's interesting watching a quickly evolving industry trying to police itself so that the leaders can find some way to distinguish themselves from the rest of the pack. Standards are helpful when there aren't clearly defined regulations or requirements imposed on an industry to operate. In most states, anybody can crush, cut, or shred complex computer equipment and potentially release an amalgam of heavy and potentially toxic metals in their computer recycling business. Compare that to the barber down the street who is required to attend a vocational program and get a permit to allow them to put a pair of scissors next to your head. In addition, for the states that do regulate the industry, their requirements are inconsistent and often weak. Some stipulate that companies must have an environmental management system. These states don't define the minimum requirements of this EMS - and they don't do any verification of the soundness of these programs. I still see some IT Asset Retirement firms claim they are "EPA Certified." There is no such thing. The US Environmental Protection Agency does not certify anyone in the electronics recycling industry and they make this explicitly clear on their web site. In the absence of regulation, standards provide a means by which companies in an industry can be compared. Standards, when independently audited, also provided a verification that companies are, in fact, in conformance with these requirements. Furthermore, when standards reflect the best practices sought after by the most progressive companies in the industry, then they declare that these firms not only have clearly defined business management systems in place, but they also have effective and high quality systems. In the IT Asset Retirement industry, ISO 14001 is often an entry point for companies who want to distinguish themselves apart from others. It requires companies to establish a sound environmental management system that is in compliance with all regulatory requirements and works to continually improve its environmental impact. This is a generic international standard that helps companies set up beneficial programs, but the standard makes no judgment about what is the most environmentally responsible approach to electronics recycling. That's why I support the new E-Stewards standard. It requires companies to be ISO 14001 Certified, and it sets a baseline of best management practices particular to this industry. It also requires processors to clearly demonstrate how they meet the prevailing demand from the public and progressive institutions to not export hazardous e-waste to poorer countries, not send computers with sensitive data to prisons, and not landfill electronics. No other standard sets this baseline. This standard is new and is just beginning to be pilot tested, so don't believe anyone who says they are certified to the E-Steward standard right now. But when it is rolled out by early 2010, then people can finally identify who are the true, independently verified leaders in the industry who we can trust will handle our electronics in a safe and secure manner. Consumer Electronics Show 2008 – How green is my new gadget? The Consumer Electronics Show (CES) concluded in January, 2008. This is the world's largest tradeshow for consumer technology . It is the place where you can find the latest and greatest electronics gadgets, from Panasonic's 150" screen TV to a $20,000 cell phone case. CES is all about buzz and extravagance. This year, for the first time, CES announced its intention to be a carbon-neutral tradeshow incorporating the use of sustainable and energy efficient practices. The show organizer partnered with CarbonFund.org to offset approximately 20,000 tons of carbon emissions associated with the show by investing in a combination of certified renewable energy, reforestation, and energy efficient projects. In addition, CES worked with its Las Vegas-based vendors to use environmentally friendly solutions such as biodegradable utensils and plates, recycled carpet, increasing the number of recycling containers for attendees, printing materials on post-consumer recycled paper with soy ink, as well as other efforts. So the show organizers are going green, what about earth-friendly gadgets? No need to worry, manufacturers are paying close attention. At Nokia's booth, the company acknowledged that consumers are asking more about the sustainability effort of new products. Nokia is taking the holistic approach to their product designs from low-power components and recycled content materials, to green packaging design considerations. Also, Iqua, a Finish company, introduced the first solar-powered Bluetooth headset. The headset is priced around $100 with 9 hours of talk time in darkness or 12 hours talk time in direct sunlight and 200 hours of standby time. NGR introduced a solar-powered charging station for all of your electronics (Blackberry, iPod, and more). Sony unveiled a flat panel TV based on Organic Light Emitting Diode (OLED). The 11" TV will consume about 45W of power vs. 350W for an average power consumption of a Plasma TV. Last but not least, Electronic Product Environmental Assessment Tool (EPEAT) from Green Electronic Council made its debut at the show. EPEAT allows buyers to identity and evaluate green electronic products according to three tiers of environmental performance. As of December 2007, federal government agencies are required to buy only EPEAT-registered products. EPEAT covers only desktops, laptops, and monitors today but the program is expected to expand to other products, as soon as late 2008. Have you looked into your datacenter lately? In early 2007, an article in eWeek reported that the electricity bills for U.S companies totaled $2.7B in 2005. During that same year, the cost of electricity for the entire world topped $7B and the total cost to power a datacenter was about 1.2% of the $7B. With an increasing demand for Internet services, music and video downloads along with telephony, the article estimated that the power consumption for datacenters would grow 40% by 2010. Further research shows that beginning in 2004, infrastructure costs have already exceeded the s cost of a server; in 2008, the energy cost alone will exceed the server cost ; and the combination of infrastructure cost and energy cost will be 75% of the total cost running a data center while IT will be only 25% in 2014. What does that really mean? It means that the traditional total cost of ownership (TCO) may not accurately reflect the true cost of ownership. A new model is needed to include the server cost as well as the infrastructure and energy cost. Moreover, the data center design will need to take optimization for the environment into consideration. Research funded by Symantec, in late 2007, of nearly 1000 datacenter managers revealed that the energy efficiency was their top priority. To improve the energy efficiency, researchers identified several strategies; such as reducing the number of physical devices to manage, specifying energy efficient CPUs, using high efficiency power supplies, implementing overall cooling systems from device-specific to racks, and implementing overall electricity-distribution systems. From the manufacturers' perspective, companies are creating technologies and products to assist datacenter managers. Multi-core processors promise increasing performance in smaller footprints. Virtualization reduces the number of servers in datacenters. Finally, Next-generation power supplies architecture facilitates improved power management strategies. These technologies and strategies point to one conclusion: future datacenters will be greener for the environment and the enterprises' pocketbook. What do you think? Do you think green datacenters are reality? I welcome your comments. What seems to be lacking (in my opinion) is constructive, educational or useful commentary about each story and how using specific services (that we offer) could have mitigated the specific issues in selected situations. Prominently displaying a link to a story containing only a summary of the horrors of data loss makes for good attention grabbing headlines however it does little more of value for the customer. Just offering links to these stories may be of some value but without adding anything, it could be seen as selling fear, “finger wagging” or generally preying on the misfortunes of others. Kevin said it best and I am in total agreement with Kevin. I am sorry that the UK government had to deal with the incident and all the backlash at home. I am also very proud that we are providing valuable services for our customers and keeping them out of headliners like this. Cascade and Software Success Partners had joined forces at the International Association of IT Asset Managers (IAITAM) 2007 annual conference. Thanks to Software Success Partners for putting a comprehensive report. The 2007 IAITAM conference was very well-received. Participants who have attended past conferences described it as “mature” - in the field itself and in the selection of topics and vendors. End-users described the conference as “enlightening and educational” as well as “very practical and useful.” An IT Asset Manager said, “The CHAMP training prior to the conference was excellent and there were some great take-aways from the conference. It was very educational but also enjoyable to be in Palm Springs.” Additionally, attendees found it invaluable to meet their peers and learn how they were handling a variety of ITAM challenges. This blog was written to capture some of the background information and links to resources shared by Neil Peters-Michaud at the October 8, 2007 e-scrap issue panel held at the Ritz-Carlton in Naples, Florida, sponsored by the Environmental Industry Association Women's Council. The IT Asset Retirement industry may be relatively new, but its evolution is a reprise of a variety of other niche businesses in the more general waste disposal and processing industry. Soon after the automobile was introduced, a secondary market emerged to service these vehicles during their use, and then manage them when the original owner was ready to pass on their vehicle to someone else, be it due to it becoming obsolete (to them) or unworkable (or at least not worth repairing themselves). The lifecycle of the automobile involves a large number of players. The Original Equipment Manufacturers (OEMs) are fed components built from raw materials by global parts producers. These OEMs design the final products based on their perception of customer demand and value engineering and then assemble them into the final product. These cars and trucks then move to resale channels, including franchised consumer auto stores and direct fleet sales. Consumers, including individuals and institutions, purchase these vehicles, and sometime even trade-in their old cast-offs at the same time. They might finance the purchase through cash up-front, bank financing or a lease. While in use, drivers take different care in operating and maintaining their vehicles. Some are reckless and may do little preventative maintenance, so that after a few years the vehicle has rapidly depreciated in value. Others may invest in preventative maintenance and careful road operation, and will find their vehicle is still valuable as they look to part with it. More importantly, they find this investment in the sound maintenance and operation of their vehicle reduces the time it is in the shop due to breakdowns and failures. To support the maintenance of vehicles, a large number of auto repair shops and supply houses provide the labor and equipment to keep cars running. Once that vehicle is ready to be left behind by its owner, he or she can look to a variety of channels to “retire” it. This may be through a convenient but lower value trade-in. It may be through selling it directly through classified ads or eBay. It may be by getting an auto wrecker to salvage it for scrap. There are a lot of options and a huge network of brokers, auction houses, parts and vehicle refurbishers, and junk yards available to cascade these cast-offs to the next best spot in the supply chain. If the vehicle is not reintroduced into the marketplace as a “pre-owned” vehicle or recovered part, it is typically recycled. Salvage yards pull out specific items with high value, such a platinum rich carburetors, and hazardous materials that can’t be shredded, such as mercury switches (or at least they should pull these out). Tires need to be removed, as well as some other materials not suitable for the shredder. The carcass is shredded and metals are segregated using various mechanical separation techniques. Unusable waste turns into fluff that is likely to be landfilled. Many recovered materials are then converted into raw materials that may end back up in new cars or other products. 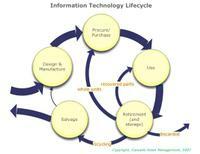 The lifecycle for information technology equipment follows nearly the same model, with similar players in the supply chain. The five primary stages in the life of a typical IT device are illustrated in the figure below. The lifecycle begins with the design and manufacture of the IT equipment, and continues to the purchase of the equipment in the marketplace, its use, and then retirement, where it follows one of four possible downstream options. In this diagram, the sizes of the arrows represent the general percentage breakdown of products moving between each stage. Similar to the auto salvage industry, there are a variety of paths used IT equipment may go during the retirement stage. In the young IT Asset Retirement industry, there is little good information available to the users of IT equipment about which disposition channel to use, resulting in many firms choosing instead to store the equipment until they make a decision later or just throw it out and remove it from the productive lifecycle. With this understanding, one can conclude that decisions made at retirement are critical to determining the optimal disposition strategy for each IT device, so that it is cascaded to its next best use, be it refurbishing and reuse as a whole unit, harvesting of parts for component recovery, processing for recycling or disposal. It is at this stage where there is the greatest opportunity for development and investment to improve efficiencies and effectiveness of service providers to optimize retirement solutions for IT equipment. In contrast, the other stages are fairly evolved and opportunities for growth are limited. A list of the major types of players in each stage is provided in the following table. Depending on who you talk to, IT asset retirement is a $2 billion to $11 billion industry. There are thousands of companies involved in all aspects of the business. Much of the talk of consolidation in the industry has yet to happen. Most major consolidation has taken place in the Salvage stage with Sims group adding mostly recycling and salvage operations into its fold in the United States, and only limited asset retirement triage and recovery capacity as a percentage of its total holdings. On the flip side, IBM Global Finance manages over $2 billion in retired IT assets each year, but a vast majority of these assets are run through independent service providers. One of the most significant opportunities to enhance the efficiency of the IT lifecycle flow is by improving the retirement supply chain. Waste haulers could have a significant role in this part of the industry. By leveraging their existing logistics supply chain to help make it as easy to responsibly dispose of an old IT device as it is to buy a new one, and to do this at a low cost to the consumer, waste haulers can help convert the 80% of old IT assets that either linger in the Retirement stage as stored devices or discarded improperly into more productive equipment continuing on in the IT lifecycle. Whether through partnerships or by building internal capacity in retirement services, there is a lot opportunity to get in on the ground floor of this immature, high growth market segment. It is important to also recognize there is a web of regulations related to state, federal and municipal environmental requirements, as well as federal and state privacy protection/data security issues. Companies need to understand their obligations under these various laws or ensure their partners are in compliance. Trade associations and government groups have done a good job outlining many of these issues and how to set up operations in compliance. The regulations also offer companies new opportunities to develop value added services to appeal to a wider market. E-Scrap Conference, hosted by Resource Recycling and E-Scrap News, taking place in Atlanta, GA from October 24 – 25: A great way to get introduced to the industry and meet many of the players. Last year’s show had more than 800 people in attendance. International Association of Electronics Recyclers: Their web site has a very thorough and validated directory of e-scrap processors and haulers, as well as other basic resources for the industry. WI Department of Natural Resources e-scrap web resource: A very nice collection of information on regulations as well as a checklist for evaluating processors. US EPA e-scrap web resource: Links to detailed resource papers and tools for generators and processors of e-scrap. It has been reported that the cost of hardware represents only 20% of the total cost of ownership of the equipment (Gartner Group, 2003). Other factors related to the management, service, support and retirement of IT equipment represent the bulk of the costs to an organization. It's best to focus early in the IT procurement and disposal planning process to investigate opportunities to improve the productive use and reduce the undesired costs related to IT asset management. It's best to consider all of these issues when embarking on developing a new IT Asset Retirement program.